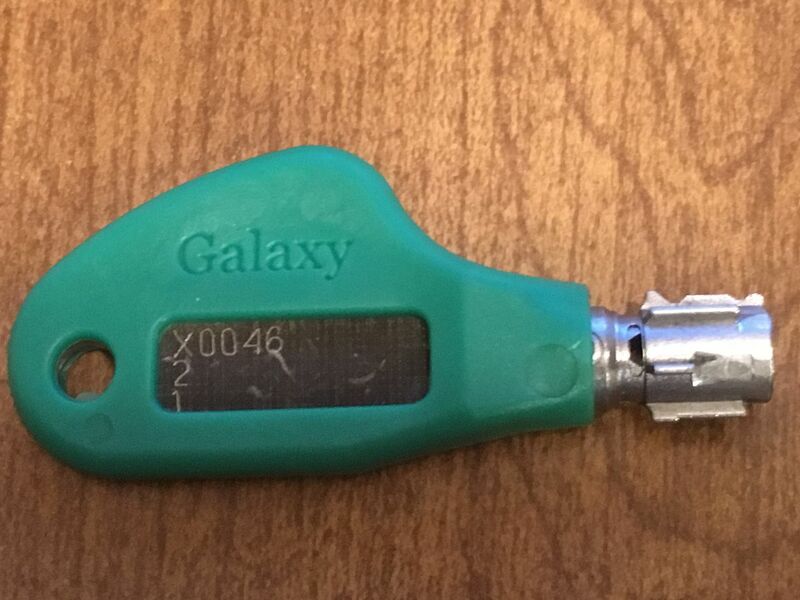 Just received an ALC (Australian Lock Company) Galaxy, so it is time for a new write-up. First, here is the baby. It sure is cute. 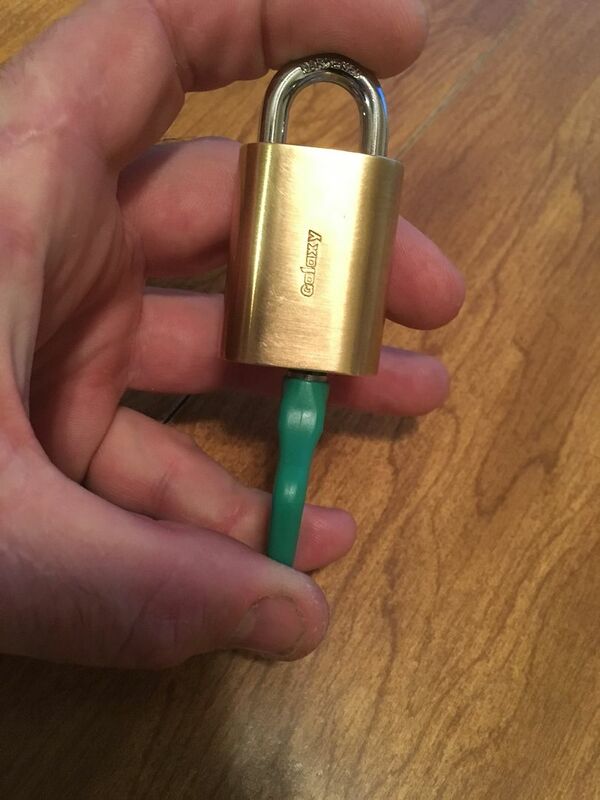 This version is a pretty small padlock, though the lock is available in several sizes of padlocks and other lock formats as well. 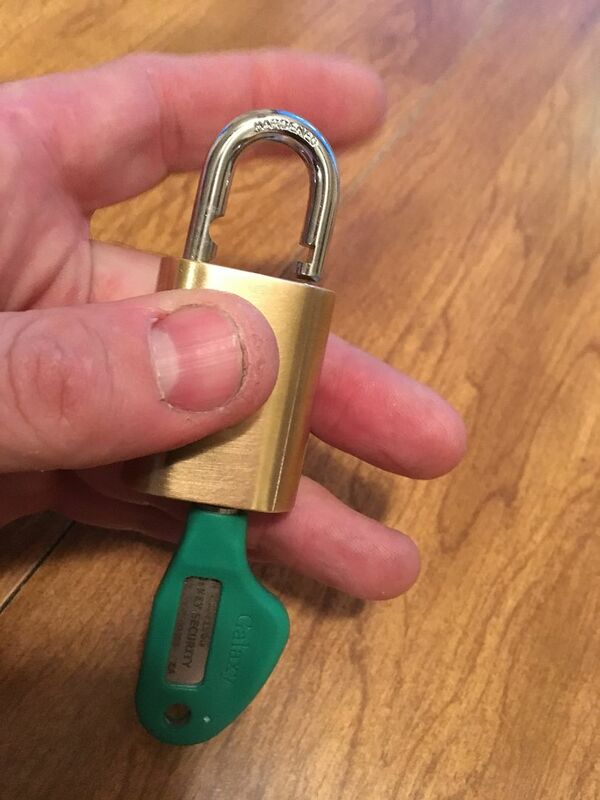 The padlock is about the same size as the key. 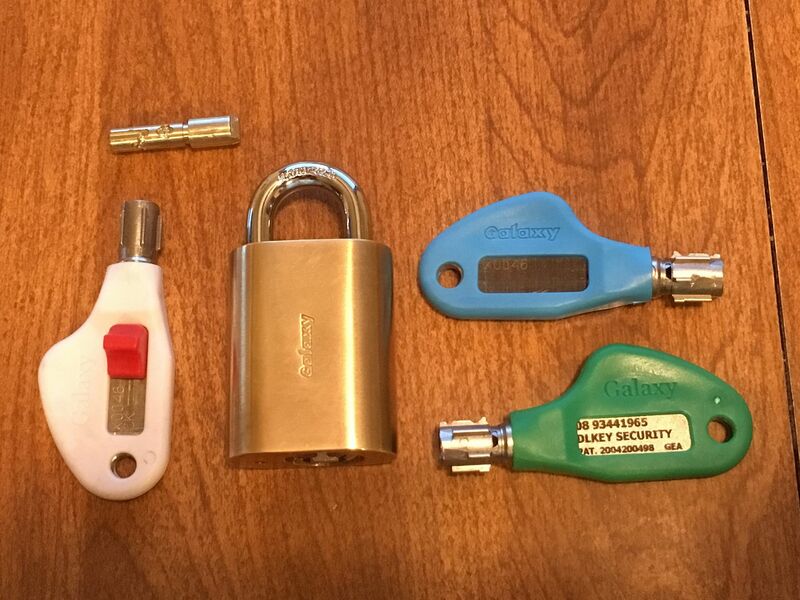 Here are the three keys. 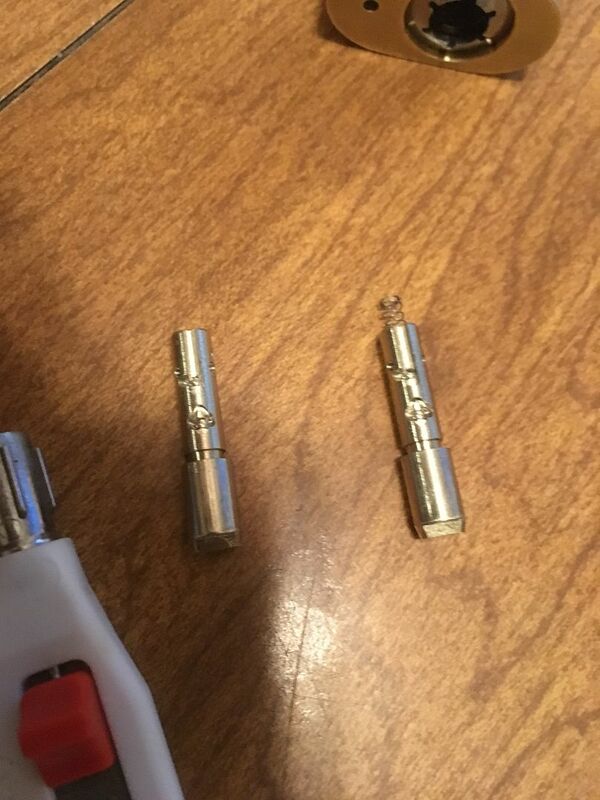 The first two are normal keys. 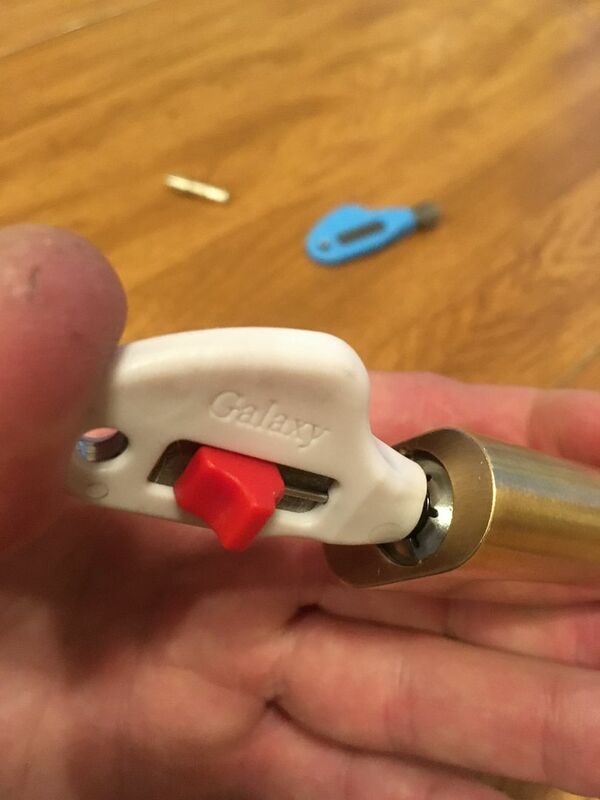 Found it interesting that the two keys (that are differently bitted) have slightly different fonts for the Galaxy name. Must be a running change. And the third key is the Removal Key. More on this key shortly. Patience, guys and gals. For those wondering how the lock itself works internally, there are a couple of videos put out that show. Since the lock can not be disassembled, this is the best that I'll get. The lock works by having five sidebars around the outside of the lock. 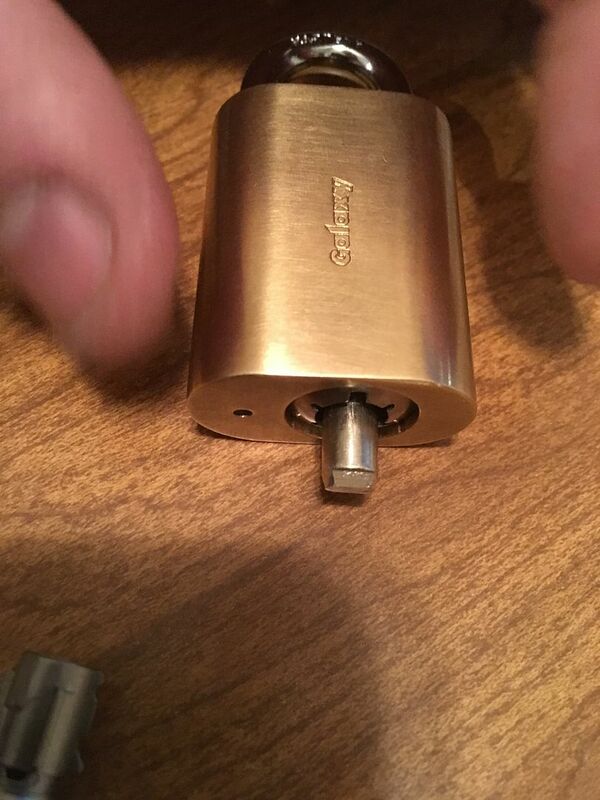 The key slides the sidebars to the correct position further into the lock. When the key is turned, the sidebars are forced inwards towards the center of the lock (called the codebar). If all the sidebars are aligned with their proper locations, then there will be a bitting hole for a post on the sidebar to drop into in the codebar, and the key can be turned. Here is a codebar. Will rotate it a couple of times so you can see all sides of it. This is the end of the codebar opposite where you put in the key. The ring shaped cutout is for a spring. 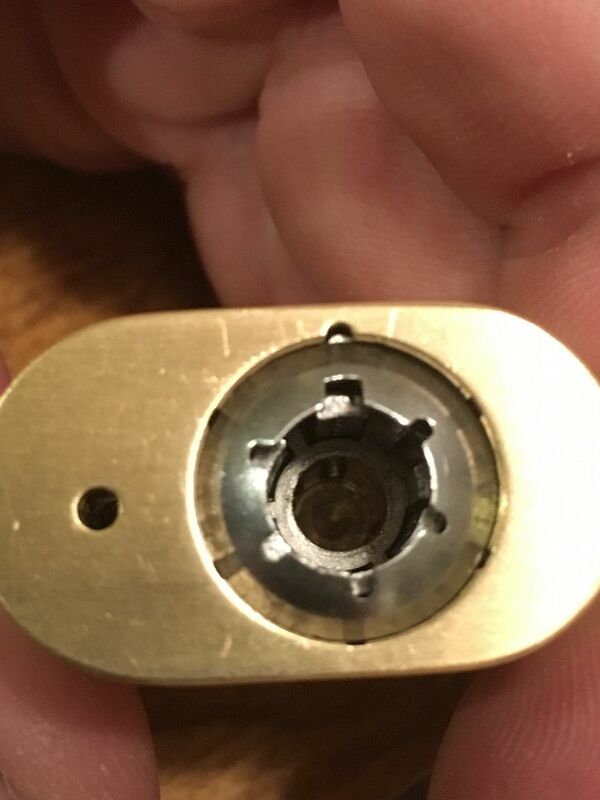 This is a side view of the end that contacts the key. 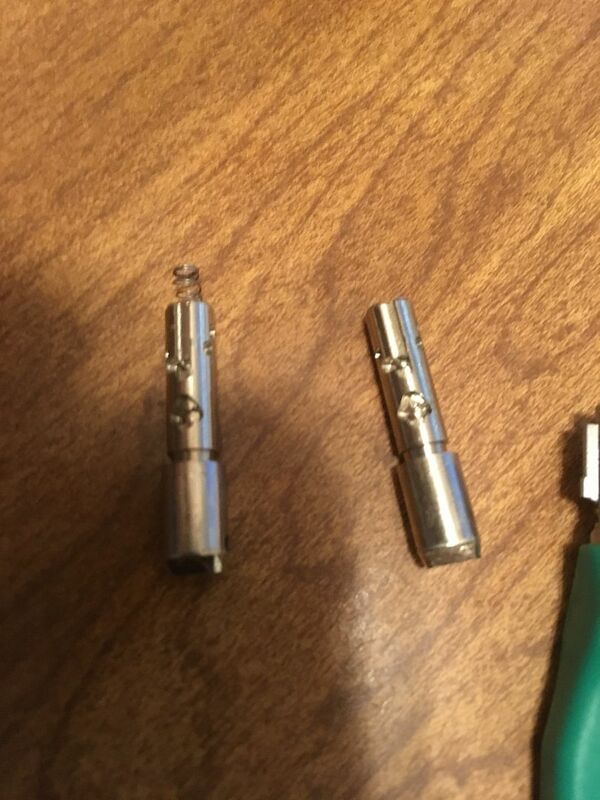 The bevel fits inside the key, which has the opposite shape, so it can be correctly rotated. Wrong rotation, and even if the key bittings are correct for the sidebar, the bittings of the codebar will not line up with the sidebars. Fairly sure that hole next to the bevel is used by the machine to align/rotate the codebar in the machine that programs (cuts) the bittings. The codebars can be set up to be horizontal to the keyway, left rotation or right rotation. 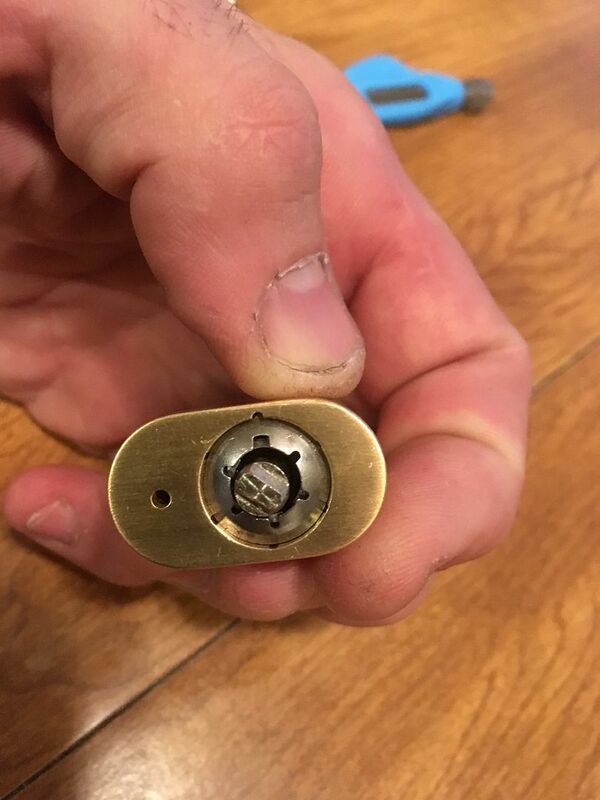 Think of Medeco pins and their rotation. But longitudinally. The codebar can even be cut (programmed) for more than one rotation on the same codebar. 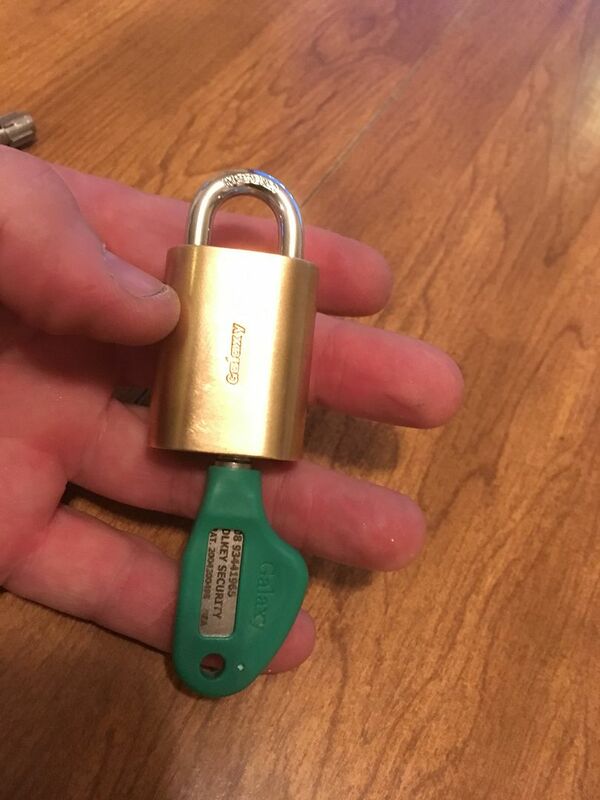 OK, time for operation of the lock. 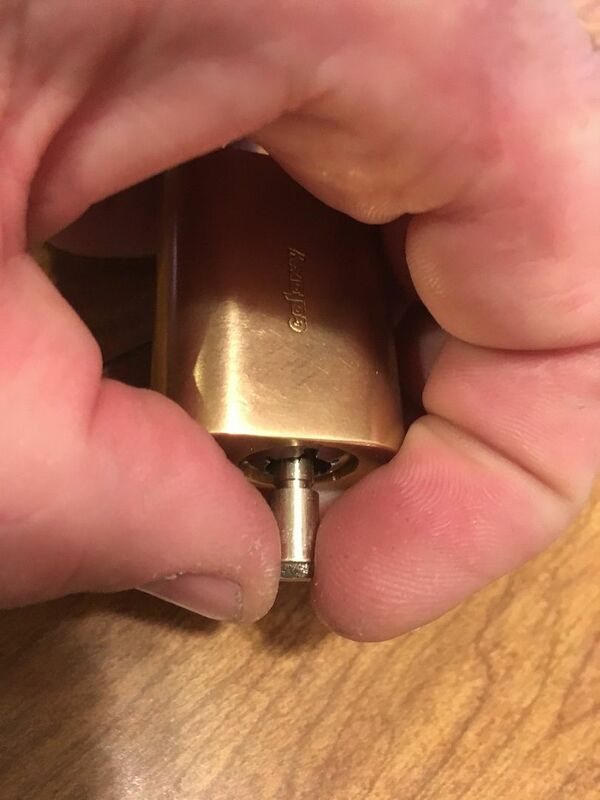 This is the keyway. Just inside the keyway, in the center, you see the end of the codebar. Notice that the width of one of the the keyway 'arms' is wider than the other five. 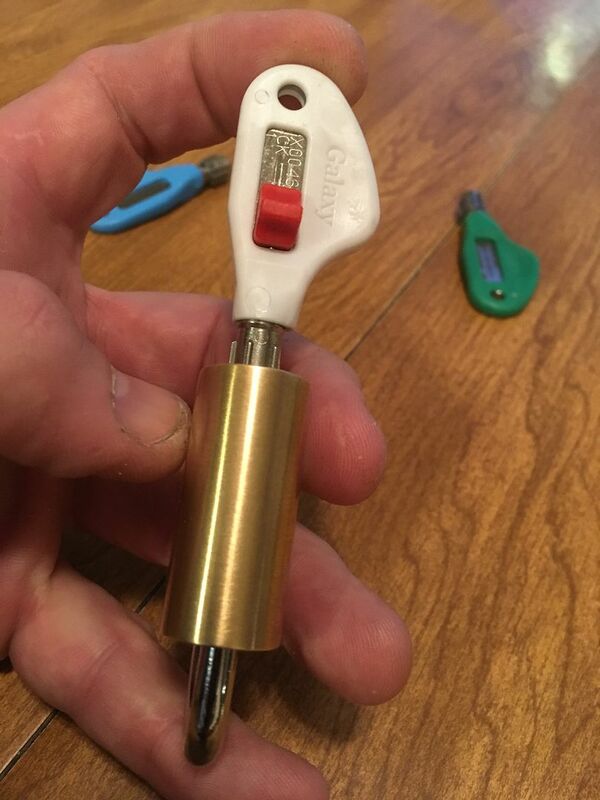 That is for ease of aligning the key. Inside the key. You can see the thicker 'arm' at the top, and the cutout inside for the codebar rotation. 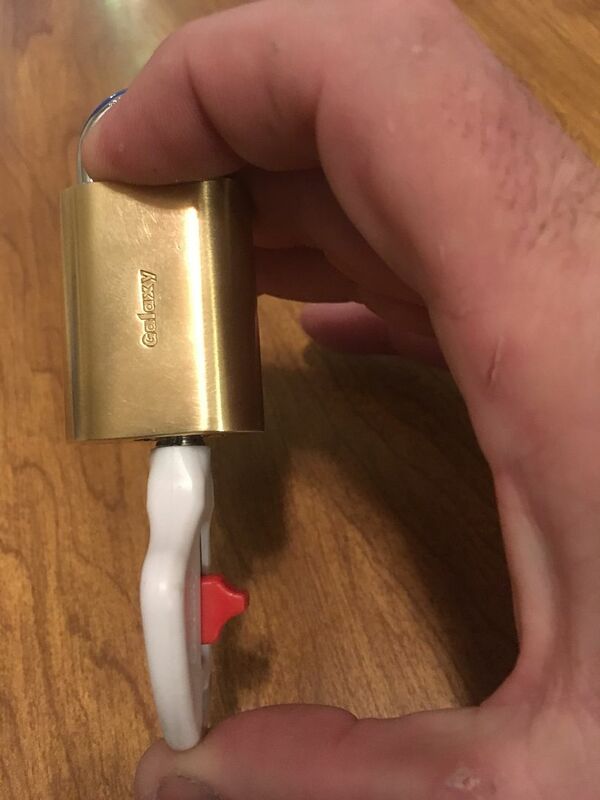 This is a push key lock, so, well, push in the key. And turn it 90 degrees. 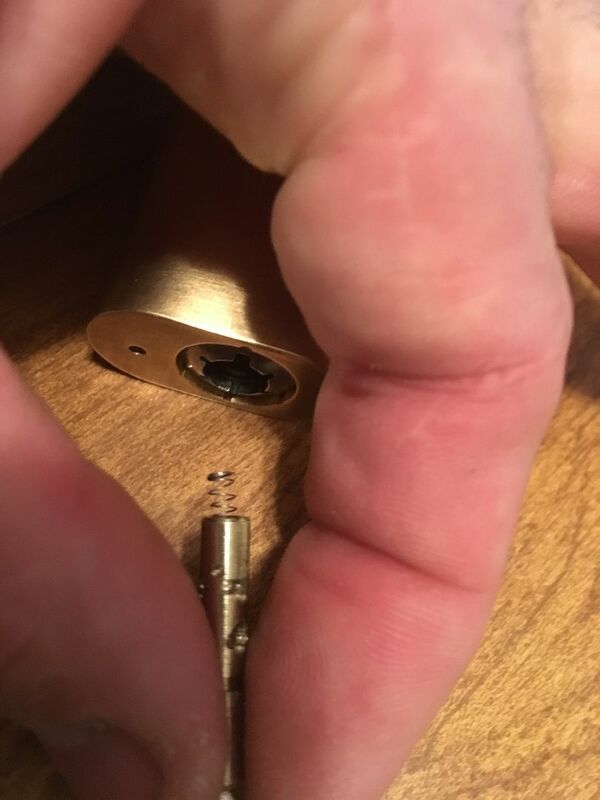 OK, how do you rekey the lock if you can't disassemble the lock? You replace the codebar, of course! 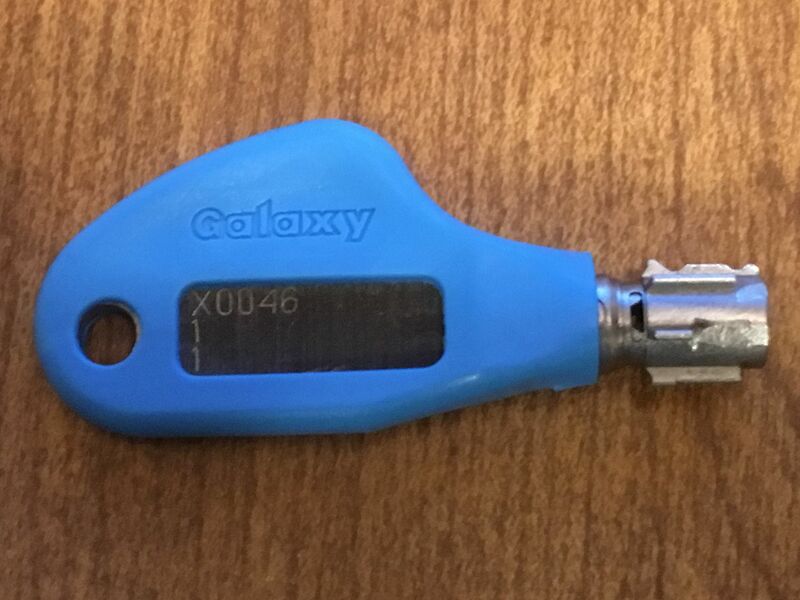 I got this lock with an extra codebar that was cut differently than the original, the operating key that matches the second codebar, and a removal key that operates with both codebars. 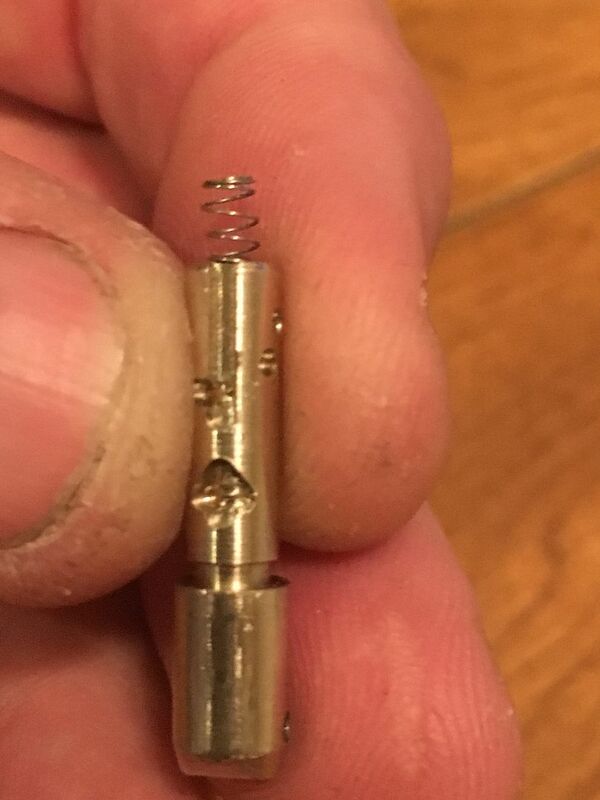 First, remember the thicker 'arm' of the keyway? The removal key will be put in aligned with that position. 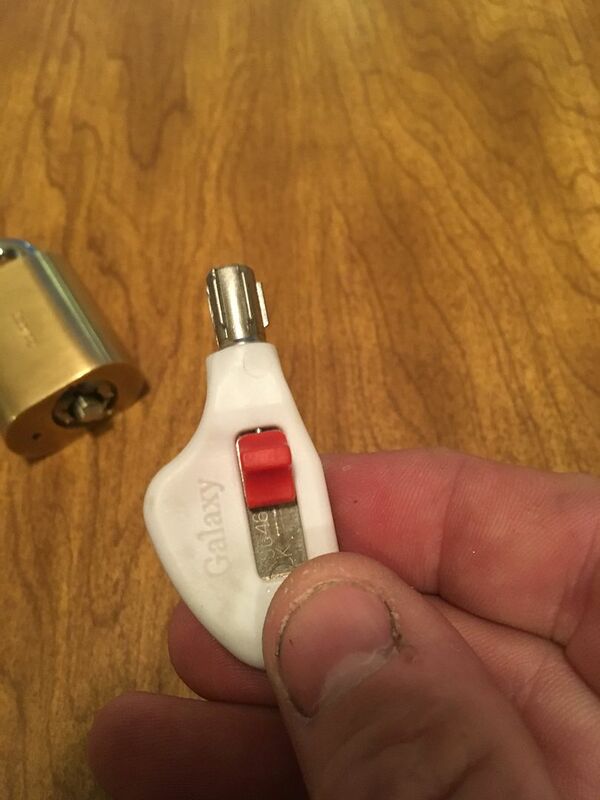 Unlike the operating keys, the removal key can be put into the lock in any position. 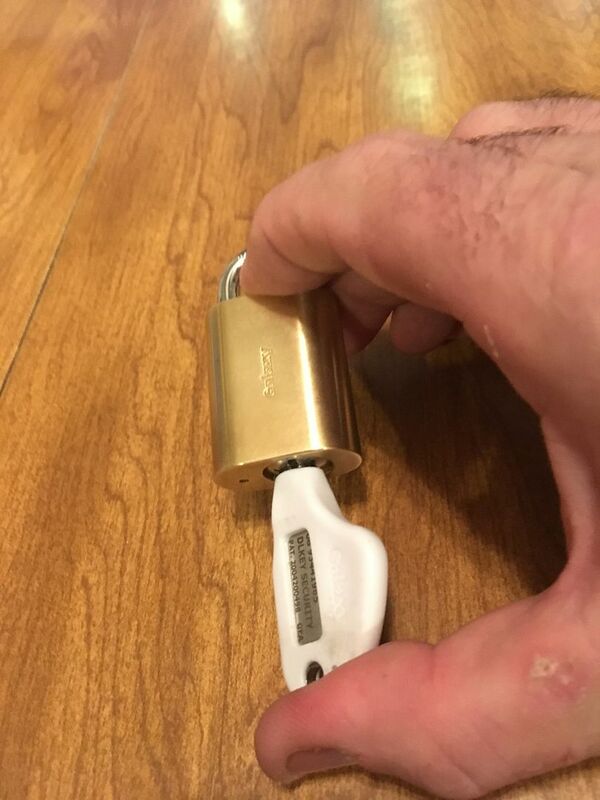 But it will only turn for removal if the key is put in like the normal key. The removal key will be turned to the next opening to the right. 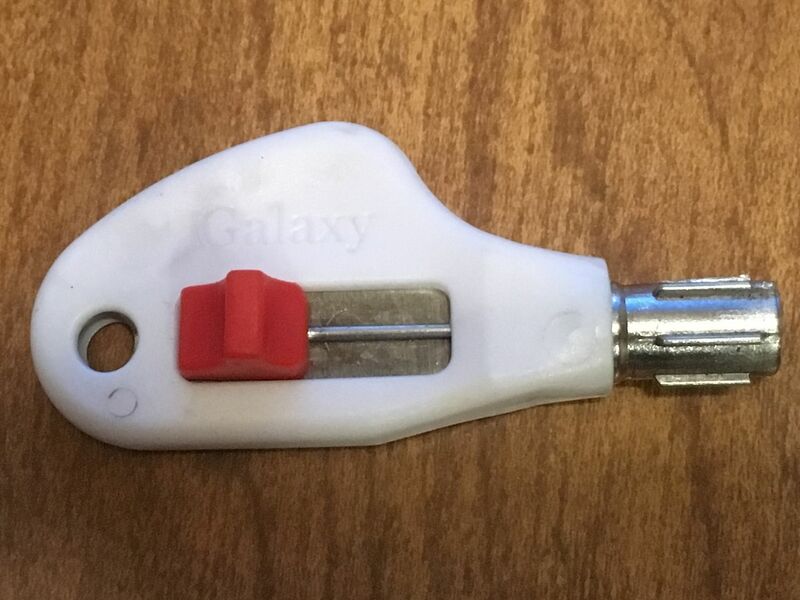 This is the removal key. 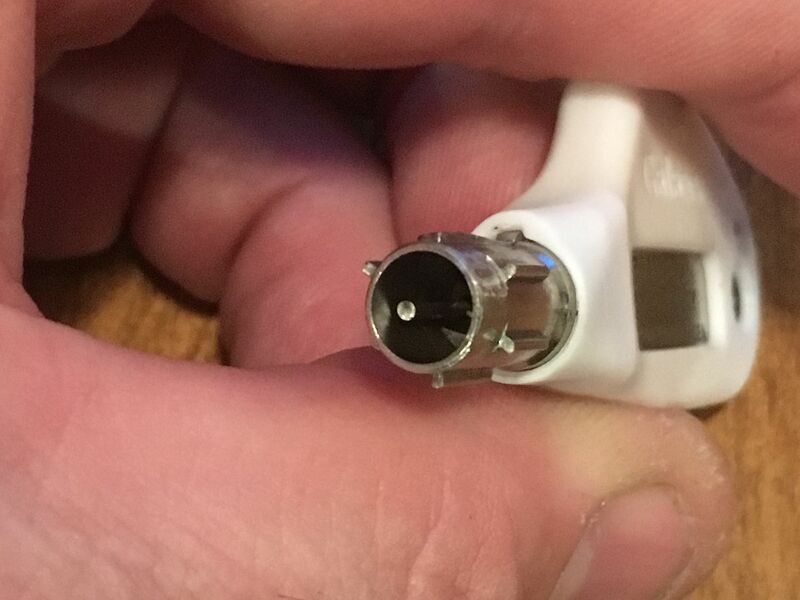 Let's take a closer look at it. 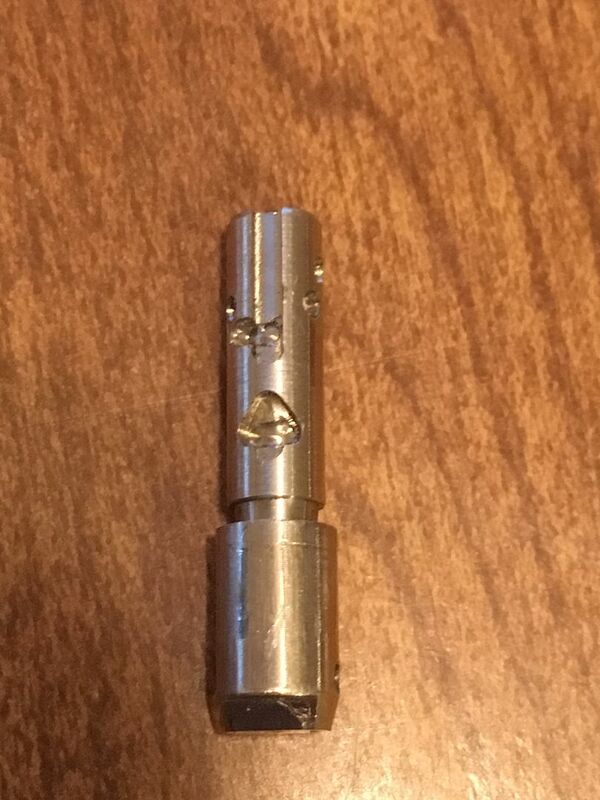 It has a slider knob on the side of it, which operates a movable post inside the key. 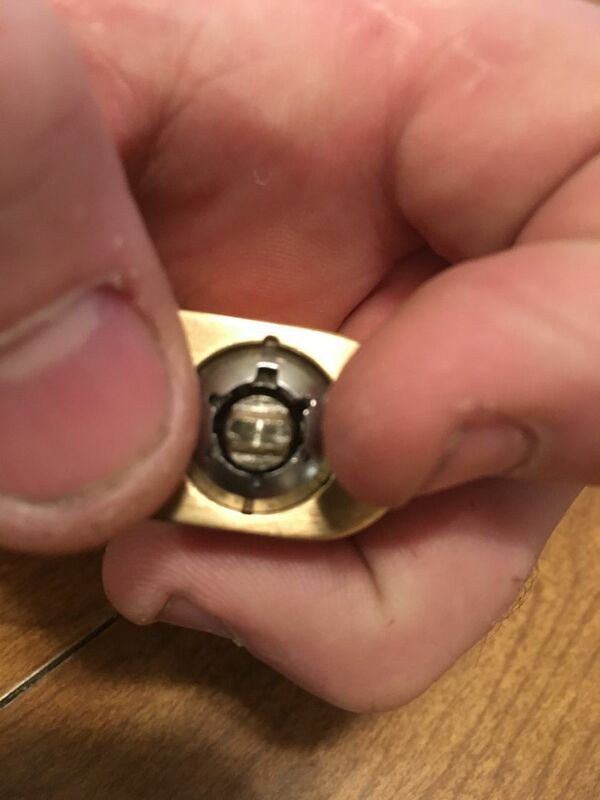 Look inside the key. Notice that the orientation of the cutout for the sidebar is not fully horizontal like the operating keys in my lock. 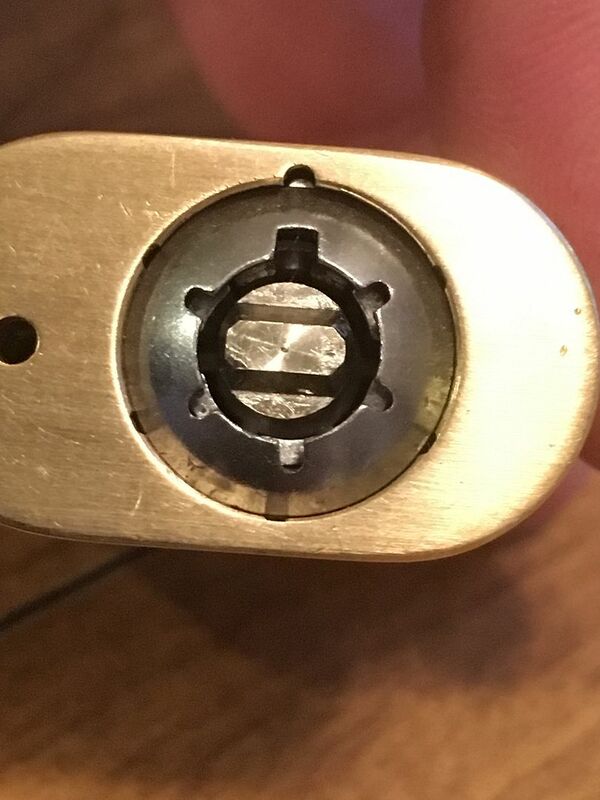 Also look on the left inside the key, you will see a hole. push... (Actually, it does not matter whether the lock is facing up or down, in case you missed the humor). 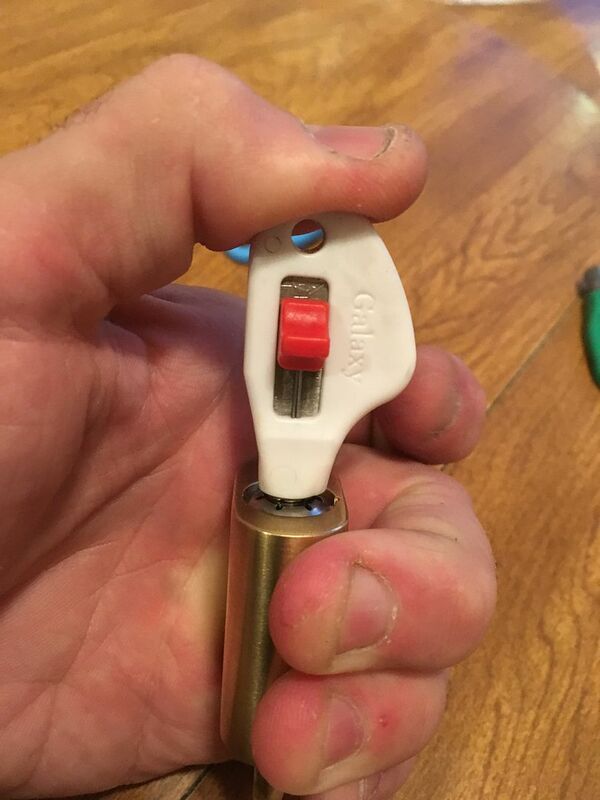 As you push in the key the red knob will slide itself back. That is OK, allow it to do so. 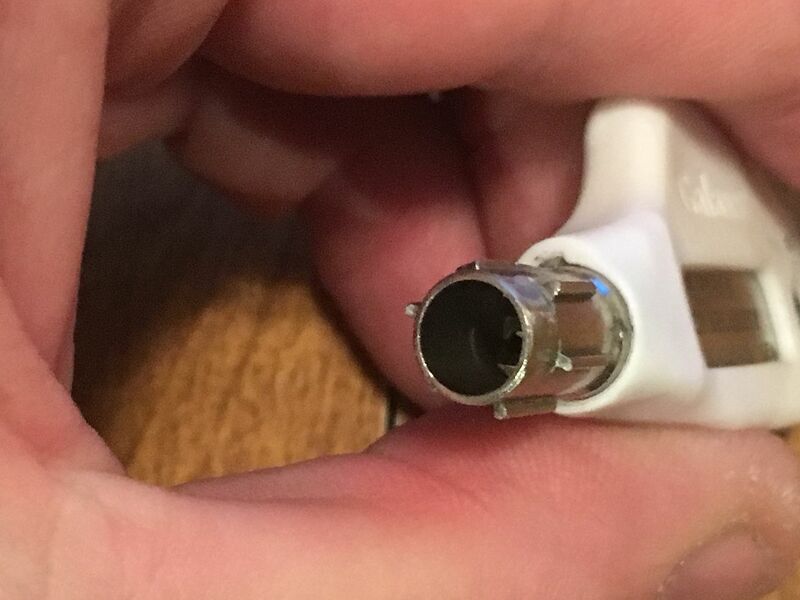 It is supposed to do that. And turn the lock to that first cutout to the right mentioned above. 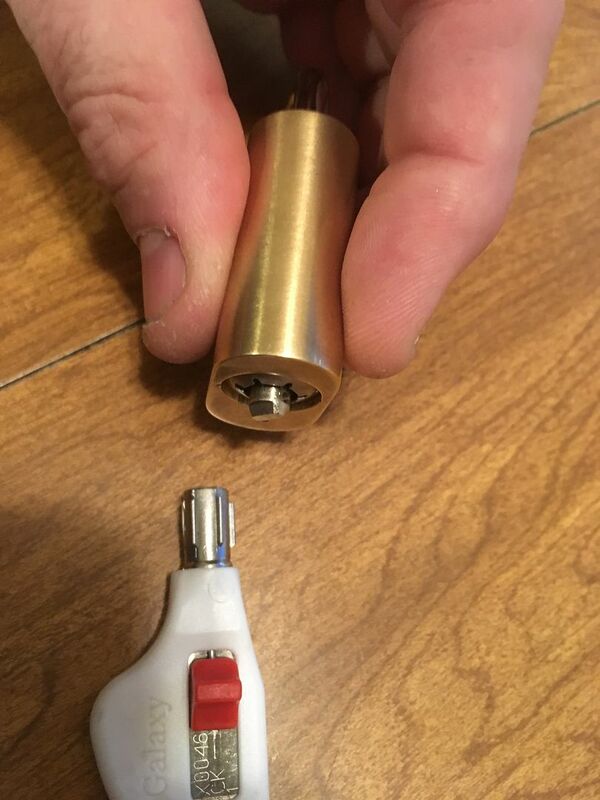 If you turn it a full 90 degrees, it will work like a operating key, just like a BiLock QC control key. Now slide that knob forward fully as you lightly pull outwards on the key. The lock will practically eject the key once the codebar has been pulled to the removal position. Now look at the codebar. It will be rotated right of where it was aligned when you started as well as being sticking out a little. Use your fingers to rotate the codebar back to the original orientation. Then use your fingers to pull the codebar straight out. CAUTION: WATCH FOR THE SPRING ON THE BACK OF THE CODEBAR It is not under tension, but it is small and you probably don't want to lose it. The original and replacement codebars side by side. 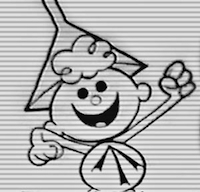 The spring is currently on the original codebar. Transfer the spring to the new codebar. 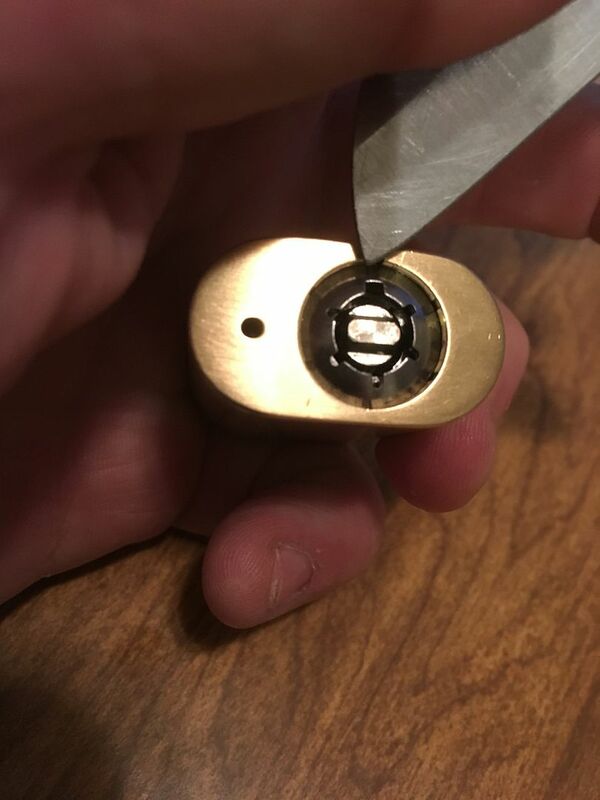 Look inside the lock core. 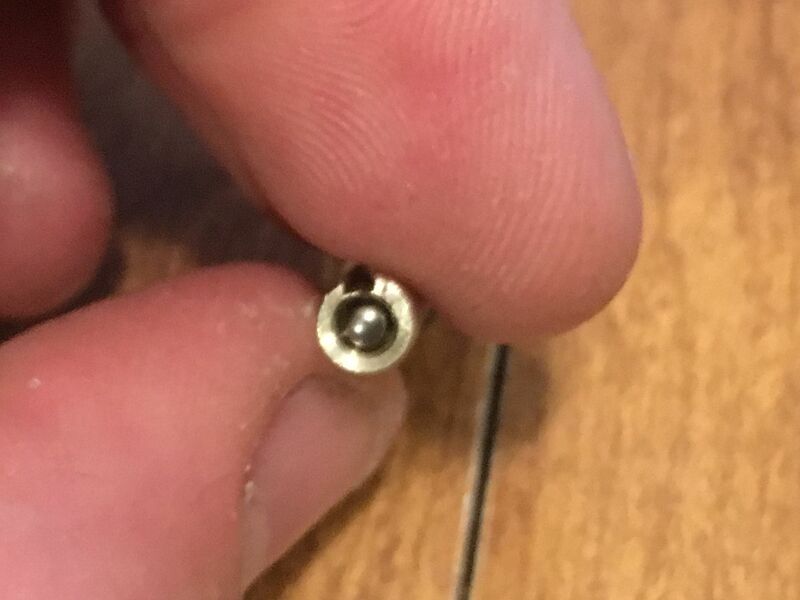 With the thick 'arm' at the top, you will see a pin sticking down in the back. 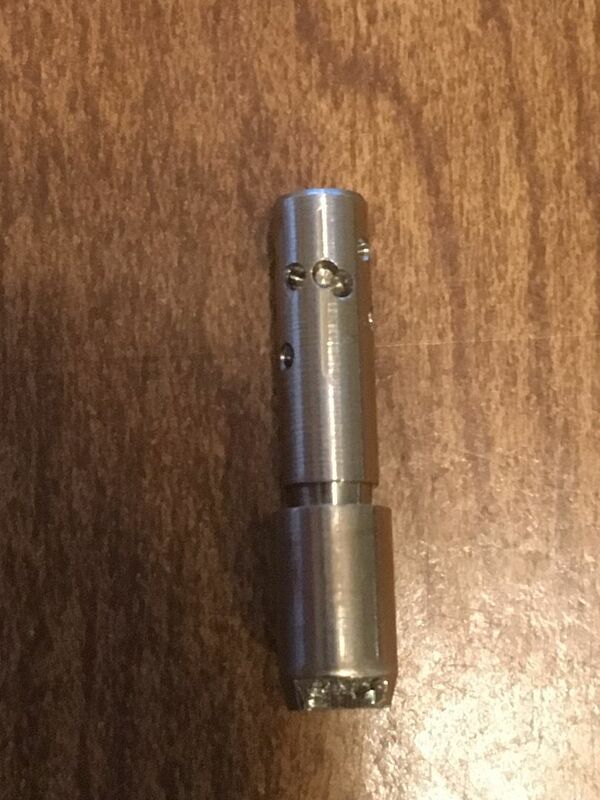 That pin is an alignment pin for the codebar. 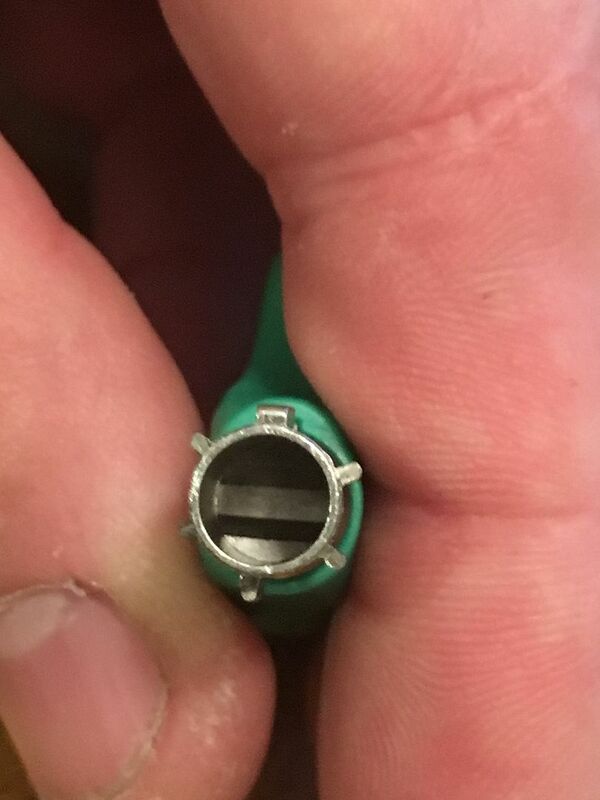 It is hard to see in the pics, but the groove is at the tip of the codebar, goes in a short distance, then angles sharply to the side. 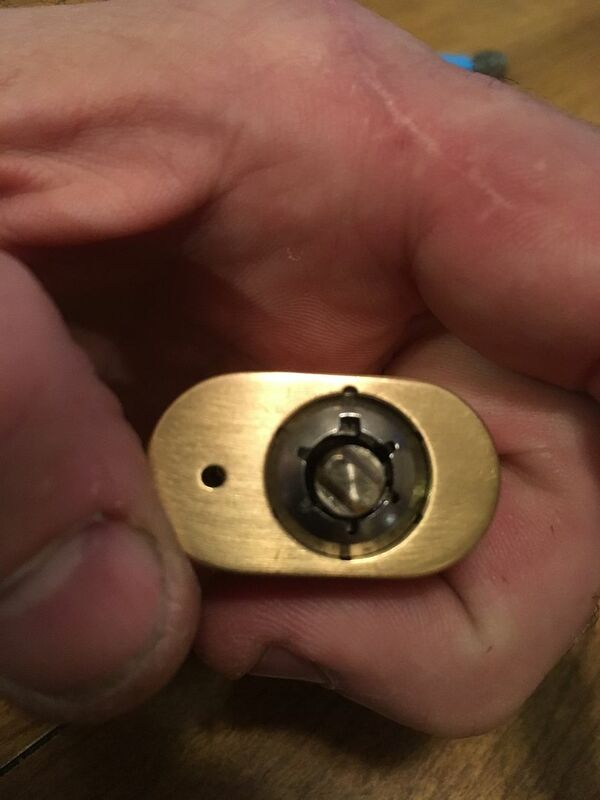 Slide the codebar (with the spring installed at the tip) into the keyway. At about this depth, you will find that you can not insert it further without having the codebar aligned with the pin. If it won't go in further, don't force it! Just rotate it until the pin and the codebar slot line up. Once you have it aligned and it can go in further, apply turning pressure to the right as you slide in the codebar. 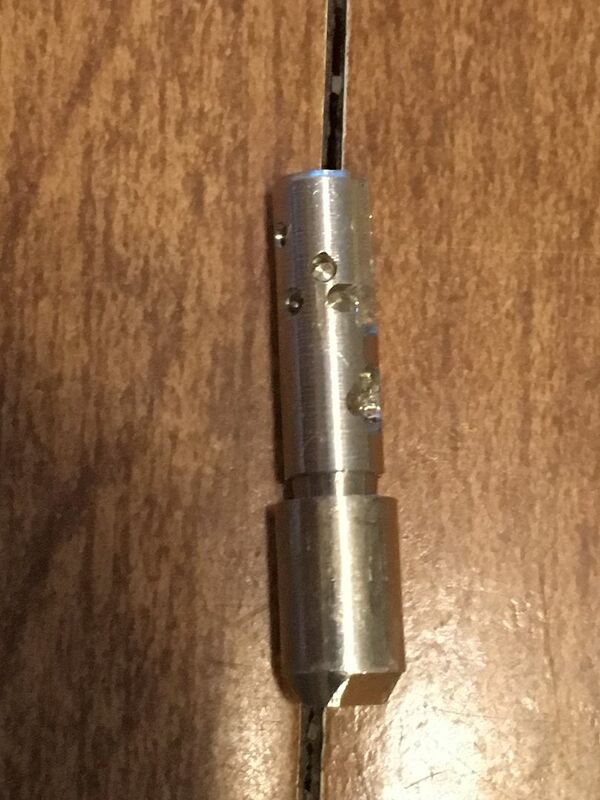 Once it is in the correct depth, it will rotate to the angle needed for the removal key. Start with the codebar knob slid fully towards the tip of the key. Push it in, allowing the knob to slide back on its own. Turn the key left to the original location. 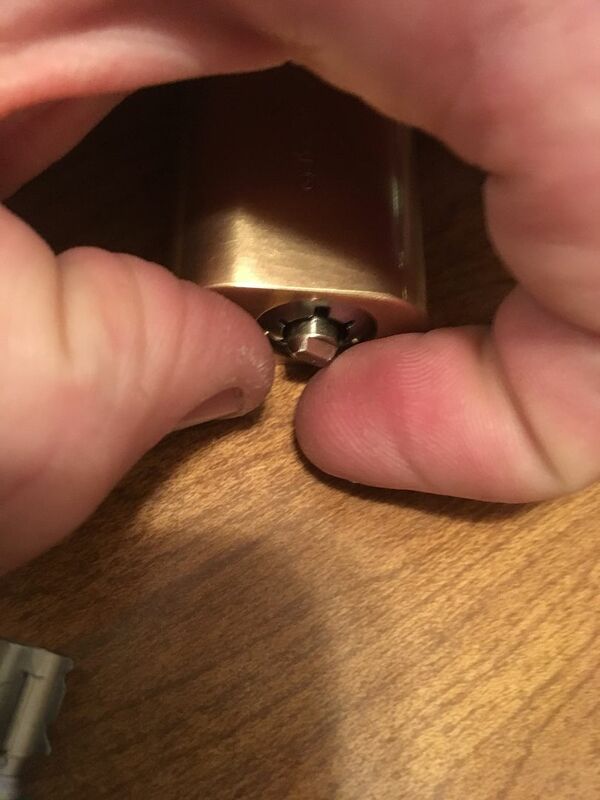 Then let the spring tension push out the removal key. The rekey is completed! 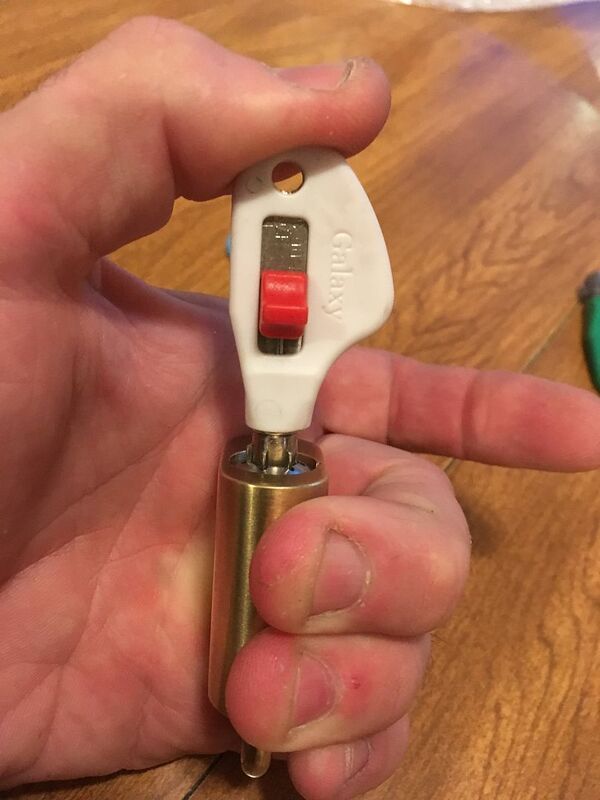 Test out your new key. And there you have it. Hope there were not too many pictures, and that it gave the info you were looking for. 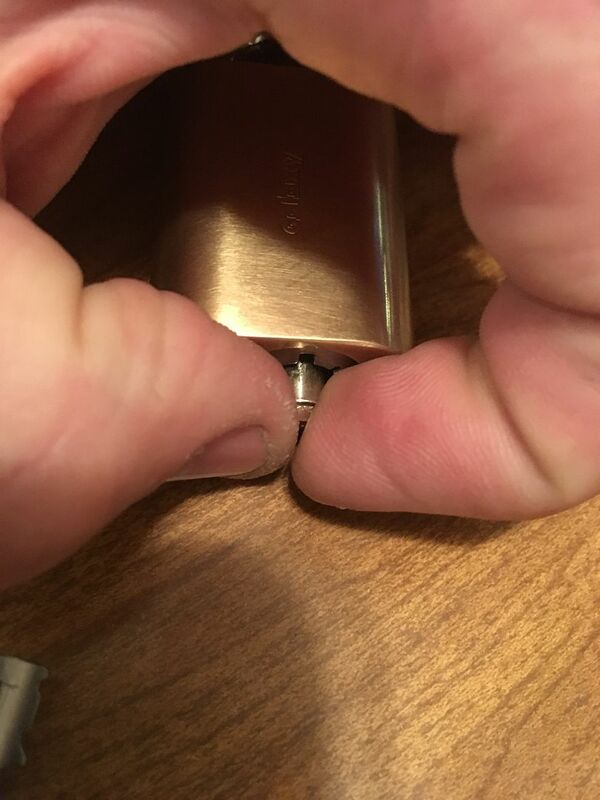 The push pull part. 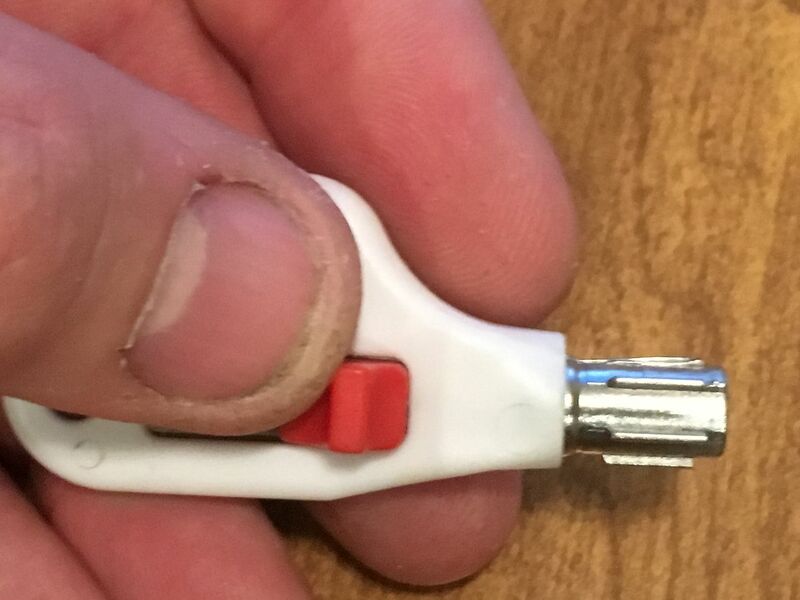 Think of using the removal key at that point like a hypodermic syringe. 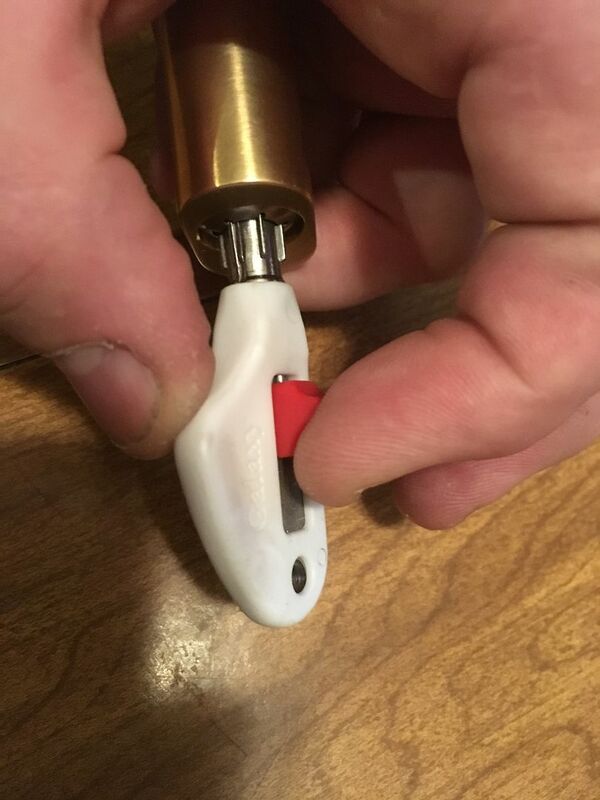 Use your first two fingers to pull the key bow on top and bottom while using your thumb on the red knob like the plunger of the syringe. Know my fingers are lined up differently in the related picture, but my hand would block the view of what I was doing. 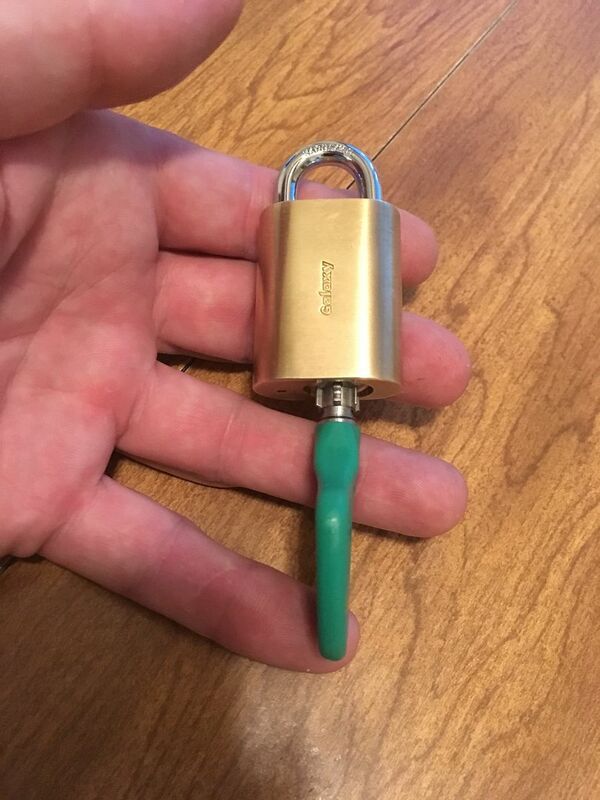 It was harder to do it the way I showed in the picture, but at least you could see the position of the lock, key and knob. Does that clarify it better? Or did I just make it worse? 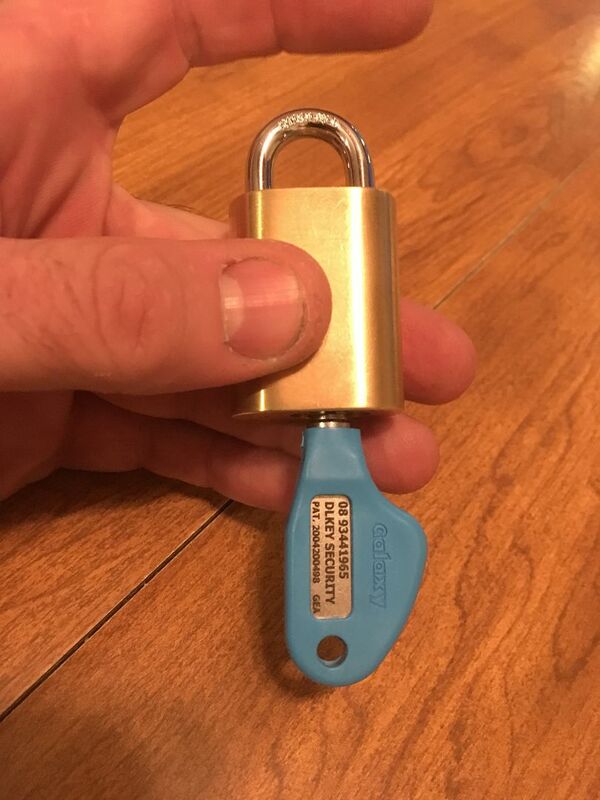 Cool lock, cool writeup Gordon! Great as always. 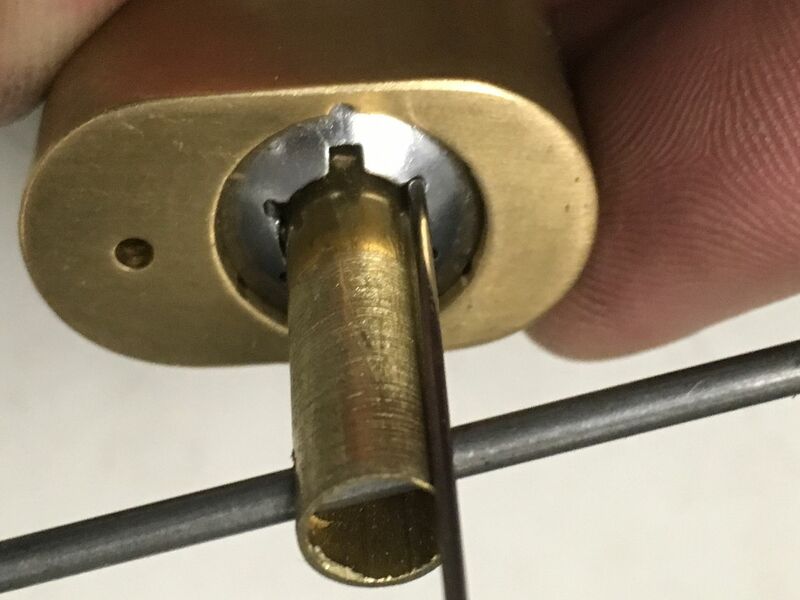 So just to be sure (like I wasn't already); if I were to not really understand how the lock functioned and if I were to make a "custom tool" that used the centre post to tension the lock - then it would be true to say that I would never pick the lock (so long as my key was a 'centre' rotation)? 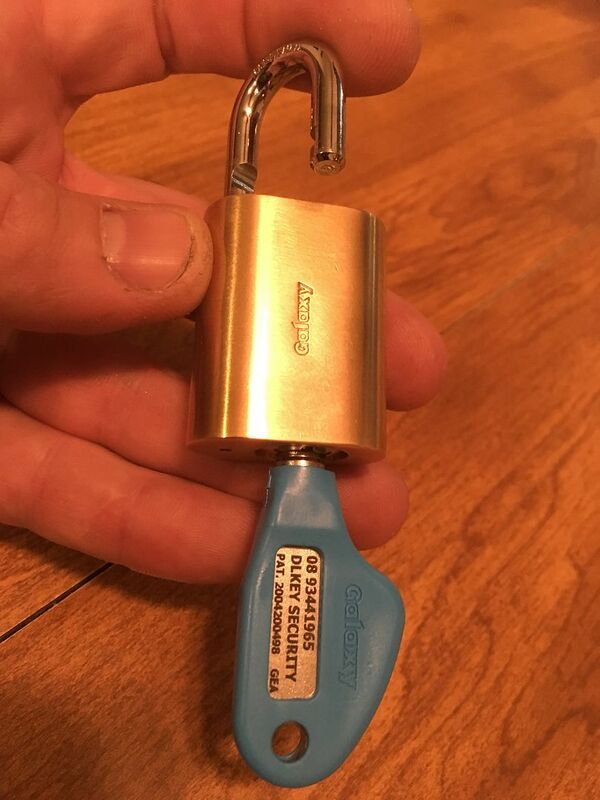 The centre post doesn't even drive the lock, right? It's the 12 O' clock part? 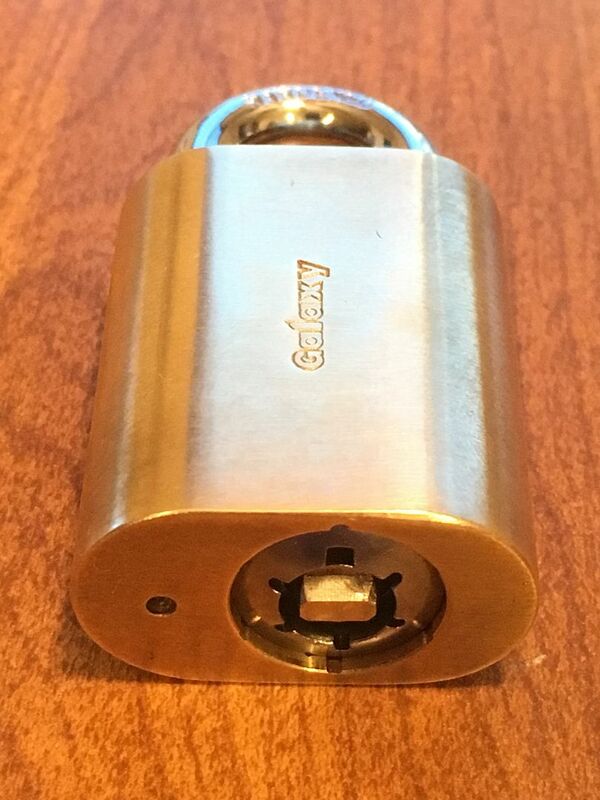 huxleypig wrote: Cool lock, cool writeup Gordon! Great as always. 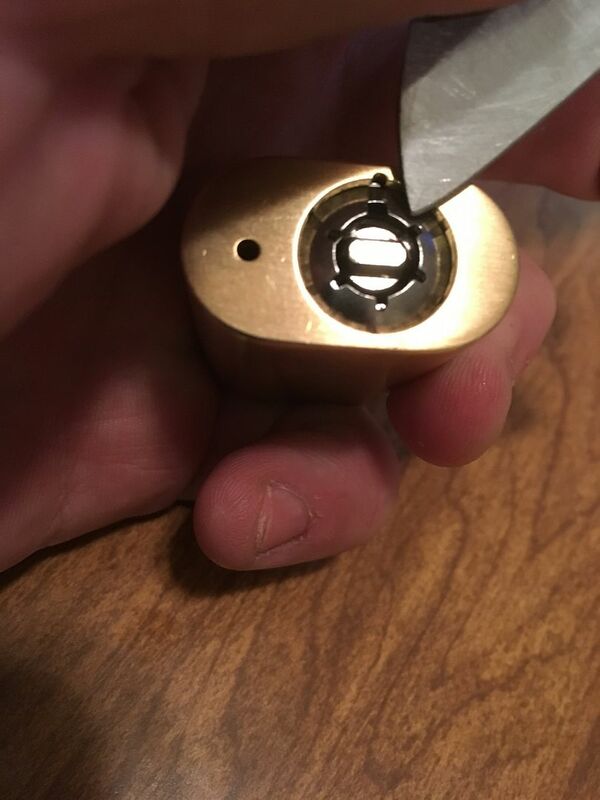 So just to be sure (like I wasn't already); if I were to not really understand how the lock functioned and if I were to make a "custom tool" that used the centre post to tension the lock - then it would be true to say that I would never pick the lock (so long as my key was a 'centre' rotation)? The centre post doesn't even drive the lock, right? It's the 12 O' clock part? 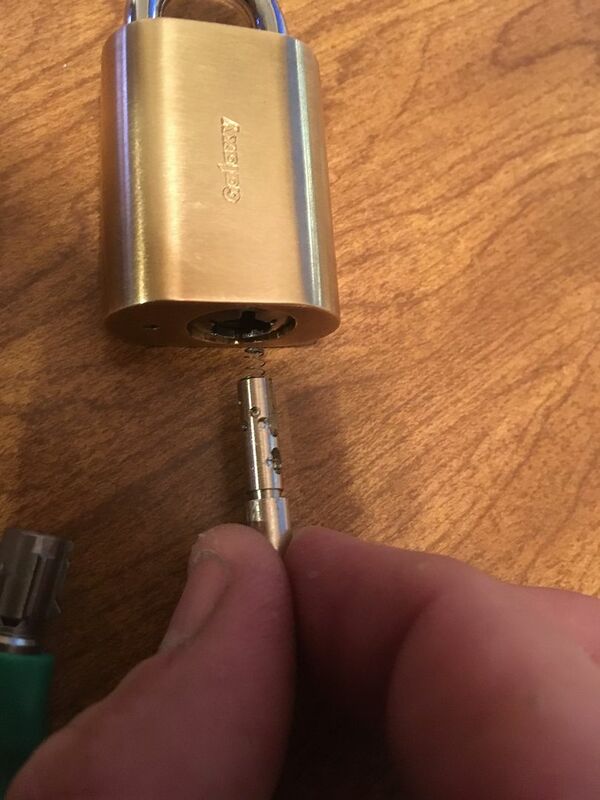 All of the posts/fins can and do drive the lock. 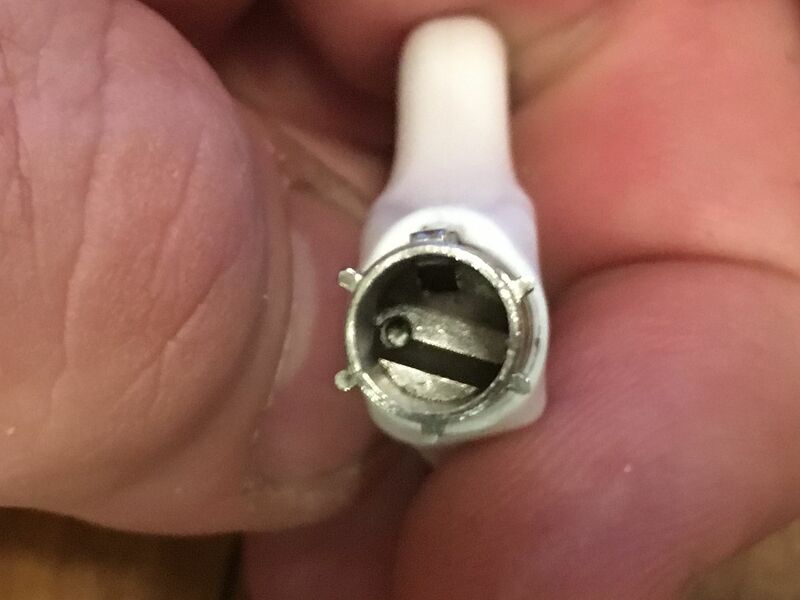 If you look at the picture of the keyway with the codebar removed, you can see how that works. I would think that you would want the 12 o’clock fin to drive the lock. Yes, if you are trying to drive the codebar (center post), you will not get the lock open. But the center post does rotate a little, as a master keyed Galaxy system can change not just the bits on the codebar, but the angle of rotation of the codebar as well. Good questions, Hux. 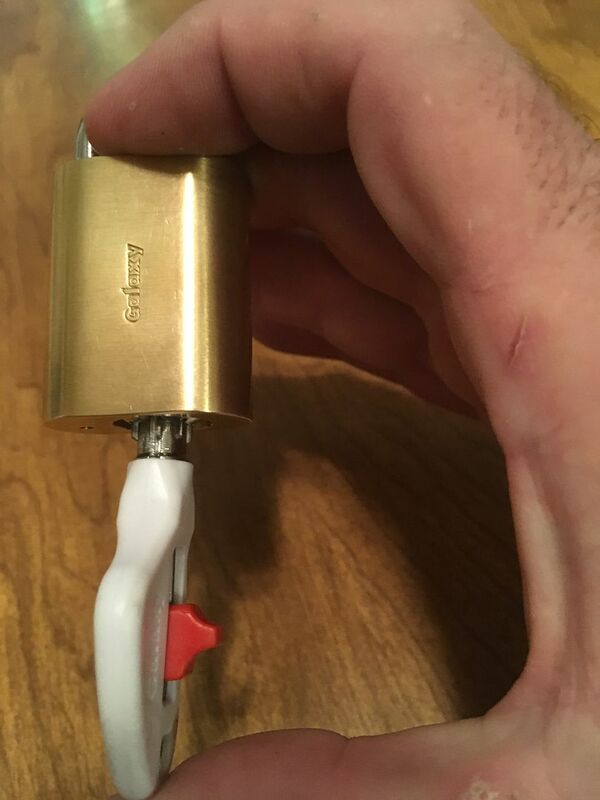 It would be interesting to see a tool designed for this lock. You might bounce ideas off of adi_picker. 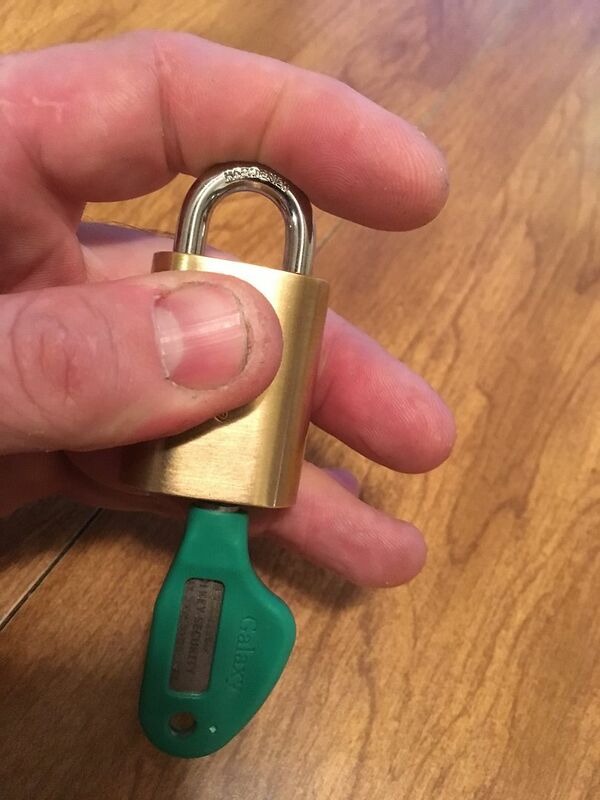 He not only got me this lock, he picked another one and posted a pic of the tensioner he made to do so. Great post, Gordon. It takes a ton of work to create a nice post like that. I appreciate your effort. What's the price point on those? 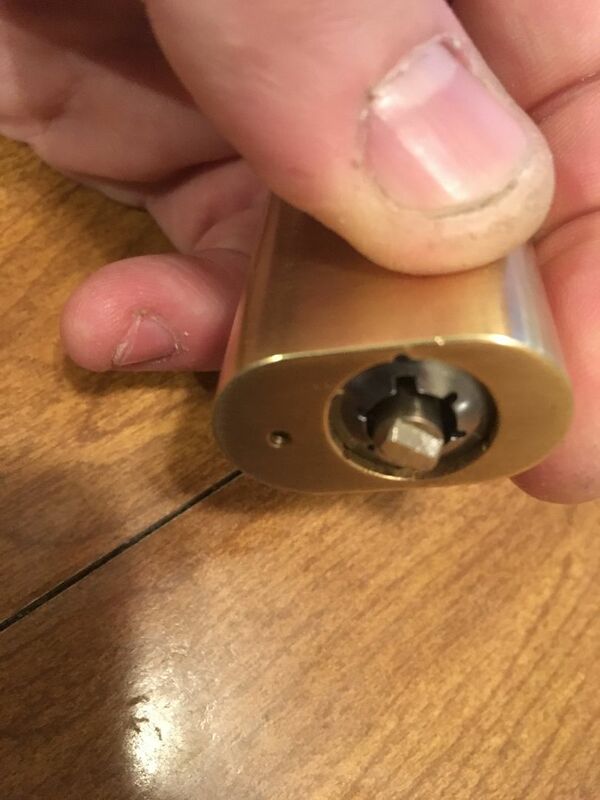 They considered high end/security locks there? Interesting stuff. I have not seen anything like this before. Thank you for the wright up. Now, have you or any other attempted to pick it yet? insatiableOne wrote: Thank You for your time. Have not, myself. But adi_picker has made a tool and picked one! OK, now I have successfully picked it a few times. Not as bad as expected. Took longer to work out making the tensioner. Thanks for taking the time Gordon; that was a real treat to see. 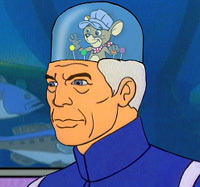 Good work Gordon. So it does tension at 12 o' clock then? I could not see anywhere for any of the sliders to push against except for a little bit at the rear of the 12 o' clock position.